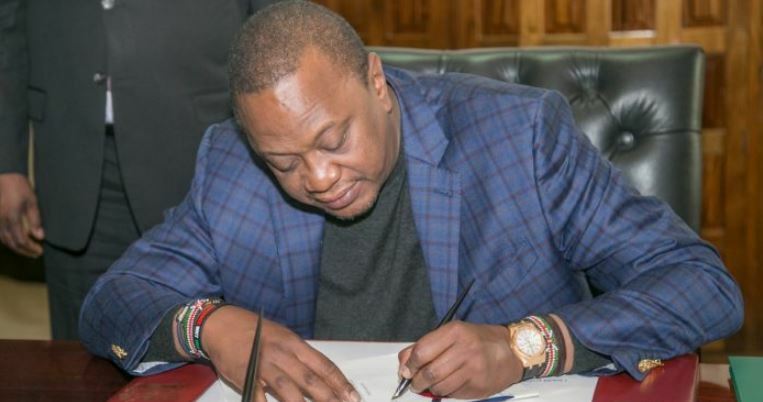 President Uhuru Kenyatta Wednesday signed into law a Bill creating a 15 percent tax relief for Kenyans buying houses under the Affordable Housing Scheme. The President signed an amendment to the Income Tax Act to create a new section that establishes an Affordable Housing Relief set at 15 percent of the gross emoluments. The tax relief is, however, not supposed to exceed Ksh108,000 per annum as set out in the Act. Affordable housing is one of the main pillars of the President’s Big Four Agenda under which the Government intends to build 500,000 new houses by 2022. The amendment to the Income Tax Act also includes the introduction of a compensation tax for power producers under a power producing agreement. President Kenyatta also signed into law an amendment to the Stamp Duty Act to exempt first-time home buyers under the affordable housing scheme from Stamp Duty. Amendments to the Stamp Duty Act also include provisions to allow the Collector of Stamp Duties to refer a valuation of property for the purpose of Stamp Duty to a registered and practising valuer. The amendment to the Stamp Duty Act is intended to fast-track valuations at the Ministry of Lands. Further, President Kenyatta approved amendments to the Value Added Tax Act to effect zero rating of ordinary bread, copra, linseeds and mustard seeds. Similarly, the VAT Act amendment zero rates inputs or raw materials for electric accumulators and separators. The aim of the amendment is to support the manufacturing pillar of the Big Four Agenda by making manufacturing of the items, especially batteries, cheaper. The amendments, all contained in the Tax Laws (Amendment) Bill 2018, were presented for the President’s signature at State House, Nairobi, by Speaker of the National Assembly Justin Muturi, Majority Leader Aden Duale, Attorney General Paul Kihara and Solicitor General Ken Ogeto.